Dialysis is most commonly prescribed for patients with temporary or permanent kidney failure. People with end-stage renal disease (ESRD) have kidneys that are no longer capable of adequately removing fluids and wastes from their body or of maintaining the proper level of certain kidney-regulated chemicals in the bloodstream. For these individuals, dialysis is the only treatment option available outside of kidney transplantation . Dialysis may also be used to simulate kidney function in patients awaiting a transplant until a donor kidney becomes available. Also, dialysis may be used in the treatment of patients suffering from poisoning or overdose in order to quickly remove drugs from the bloodstream. As of December 31, 2000, in the United States, over 275,000 people were undergoing regular dialysis treatments to manage their ESRD. Diabetes mellitus is the leading single cause of ESRD. According to the 2002 Annual Data Report of the United States Renal Data System (USRDS), 42% of non-Hispanic dialysis patients in the United States have ESRD caused by diabetes. People of Native American and Hispanic descent are at an elevated high risk for both kidney disease and diabetes. ESRD caused by diabetes occurred in 65% of Hispanic dialysis patients. And of those Native Americans who had been on dialysis for one year in 1999, 82% had diabetes. Hypertension (high blood pressure) is the second leading cause of ESRD in adults, accounting for 25.5% of the patient population, followed by glomerulonephritis (8.4%). African-Americans are more likely to develop hypertension-related ESRD than whites and Hispanics. time on dialysis than adults; according to the USRDS the average waiting period for a kidney transplant for patients under age 20 is 10 months, compared to the adult wait of approximately two years. There are two types of dialysis treatment: hemodialysis and peritoneal dialysis. Since the 1980s, the majority of hemodialysis treatments in the United States have been performed with hollow fiber dialyzers. A hollow fiber dialyzer is composed of thousands of tube-like hollow fiber strands encased in a clear plastic cylinder several inches in diameter. There are two compartments within the dialyzer (the blood compartment and the dialysate compartment). The membrane that separates these two compartments is semipermeable. This means that it allows the passage of certain sized molecules across it, but prevents the passage of other, larger molecules. As blood is pushed through the blood compartment in one direction, suction or vacuum pressure pulls the dialysate through the dialysate compartment in a countercurrent, or opposite direction. These opposing pressures work to drain excess fluids out of the bloodstream and into the dialysate, a process called ultrafiltration. A second process called diffusion moves waste products in the blood across the membrane and into the dialysate compartment, where they are carried out of the body. At the same time, electrolytes and other chemicals in the dialysate solution cross the membrane into the blood compartment. The purified, chemically balanced blood is then returned to the body. Most hemodialysis patients require treatment three times a week, for an average of three to four hours per dialysis "run." Specific treatment schedules depend on the type of dialyzer used and the patient's current physical condition. In peritoneal dialysis, the patient's peritoneum, or lining of the abdomen, acts as a blood filter. A catheter is surgically inserted into the patient's abdomen. During treatment, the catheter is used to fill the abdominal cavity with dialysate. Waste products and excess fluids move from the patient's bloodstream into the dialysate solution. After a waiting period of six to 24 hours, depending on the treatment method used, the waste-filled dialysate is drained from the abdomen and replaced with clean dialysate. Continuous ambulatory peritoneal dialysis (CAPD). CAPD is a continuous treatment that is self-administered and requires no machine. The patient inserts fresh dialysate solution into the abdominal cavity, waits four to six hours, and removes the used solution. The solution is immediately replaced with fresh dialysate. A bag attached to the catheter is worn under clothing. Continuous cyclic peritoneal dialysis (CCPD). Also called automated peritoneal dialysis (APD), CCPD is an overnight treatment that uses a machine to drain and refill the abdominal cavity, CCPD takes 10 to 12 hours per session. Intermittent peritoneal dialysis (IPD). This hospital-based treatment is performed several times a week. A machine administers and drains the dialysate solution, and sessions can take 12 to 24 hours. Patients are weighed immediately before and after each hemodialysis treatment to evaluate their fluid retention. Blood pressure and temperature are taken and the patient is assessed for physical changes since their last dialysis run. Regular blood tests monitor chemical and waste levels in the blood. Prior to treatment, patients are typically administered a dose of heparin, an anticoagulant that prevents blood clotting, to ensure the free flow of blood through the dialyzer and an uninterrupted dialysis run for the patient. Dialysis is just one facet of a comprehensive treatment approach for ESRD. Although dialysis treatment is very effective in removing toxins and fluids from the body, there are several functions of the kidney it cannot mimic, such as regulating high blood pressure and red blood cell production. Patients with ESRD need to watch their dietary and fluid intake carefully and take medications as prescribed to manage their disease. Hematocrit (Hct) levels, a measure of red blood cells, are typically low in ESRD patients. This deficiency is caused by a lack of the hormone erythropoietin, which is normally produced by the kidneys. The problem is elevated in hemodialysis patients, who may incur blood loss during hemodialysis treatments. Epoetin alfa, or EPO (sold under the trade name Epogen), a hormone therapy, and intravenous or oral iron supplements are used to manage anemia in dialysis patients. Because there is a great deal of blood exposure involved in dialysis treatment, a slight risk of contracting hepatitis B and hepatitis C exists. The hepatitis B vaccination is recommended for most hemodialysis patients. As of 2001, there has only been one documented case of HIV being transmitted in a United States dialysis unit to a staff member, and no documented cases of HIV ever being transmitted between dialysis patients in the United States. The strict standards of infection control practiced in modern hemodialysis units minimizes the chance of contracting one of these diseases. Because dialysis is an ongoing treatment process for many patients, a baseline for normalcy can be difficult to gauge. Puffiness in the patient related to edema, or fluid retention, may be relieved after dialysis treatment. The patient's overall sense of physical well being may also be improved. Monthly blood tests to check the levels of urea, a waste product, help to determine the adequacy of the dialysis prescription. Another test, called Kt/V (dialyzer clearance multiplied by time of treatment and divided by the total volume of water in the patient's body), is also performed to assess patient progress. A urea reduction ratio (URR) of 65% or higher, and a Kt/V of at least 1.2 are considered the benchmarks of dialysis adequacy by the Kidney Disease Outcomes Quality Initiative (K/DOQI) of the National Kidney Foundation. The USRDS reports that mortality rates for individuals on dialysis are also significantly higher than both kidney transplant patients and the general population, and expected remaining lifetimes of chronic dialysis patients are only one-fourth to one-fifth that of the general population. The hospitalization rates for people with ESRD are four times greater than that of the general population. The only alternative to dialysis for ESRD patients is a successful kidney transplant. However, demand for donor kidneys has traditionally far exceeded supply. As of March 1, 2003, there were 53,619 patients on the United Network for Organ Sharing (UNOS) waiting list for a kidney transplant, with an additional 2,405 waiting for a combination kidney and pancreas transplant. In the entire year of 2001, only 14,095 donors gave kidneys, according to UNOS. For patients with diabetes, the number one cause of chronic kidney failure in adults, the best way to avoid ESRD and subsequent dialysis is to maintain tight control of blood glucose levels through diet, exercise , and medication. Controlling high blood pressure is also important. National Kidney Foundation. Dialysis Outcomes Quality Initiatives (NOQI). Vol. 1-5. New York: National Kidney Foundation, 1997. U.S. Renal Data System. USRDS 2002 Annual Data Report: Atlas of End-Stage Renal Disease in the United States. Bethesda, MD: The National Institutes of Health, National Institute of Diabetes and Digestive and Kidney Diseases, 2002. Eknoyan G., G. J. Beck, et al. "Effect of Dialysis Dose and Membrane Flux in Maintenance Hemodialysis." New England Journal of Medicine 347 (December 19, 2002): 2010–2019. American Association of Kidney Patients. 3505 E. Frontage Rd., Suite 315, Tampa, FL 33607. (800) 749-2257. http://www.aakp.org . American Kidney Fund (AKF). Suite 1010, 6110 Executive Boulevard, Rockville, MD 20852. (800) 638-8299. http://www.akfinc.org . United States Renal Data System (USRDS), Coordinating Center. The University of Minnesota, 914 South 8th Street, Suite D-206, Minneapolis, MN 55404. 1-888-99USRDS. http://www.usrds.org . The dialysis treatment prescription and regimen is usually overseen by a nephrologist (a doctor that specializes in the kidney). The hemodialysis treatment itself is typically administered by a nurse or patient care technician in outpatient clinics known as dialysis centers, or in hospital-based dialysis units. In-home hemodialysis treatment is also an option for some patients, although access to this type of treatment may be limited by financial and lifestyle factors. An investment in equipment is required and another person in the household should be available for support and assistance with treatments. Peritoneal dialysis is also performed at home by the patient, perhaps with the aide of a home health-care worker. 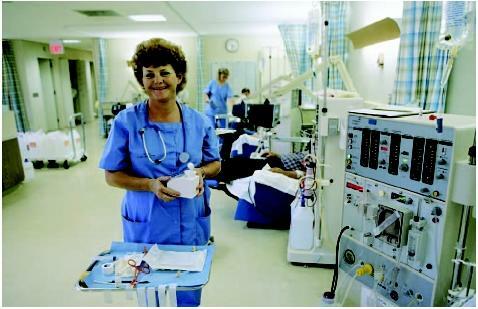 When and where will my dialysis treatments be scheduled? How should my diet change now that I'm on dialysis? What kind of vascular access will I get? Does my new dialysis center have a dialyzer reuse program? If so, what safety checks are in place to ensure I receive a properly treated dialyzer? What can I do to make dialysis more effective? Can you refer me to any ESRD patient support groups? Should I change my medication routine? This article was most interesting. It answered all of my questions and was well put together. May I register my thanks for the precise, well presented info. My 30 year old brother was diagonised with ESRD in July this year as a result of diabetes which he has had since he was 13. Is there a reason he is so prone to infections? He is in hospital every 3 weeks with a terrible infection. Is there a reason why it is so difficult to conntrol his sugar? now it is 1.2(very low) and he is comatose, the mext it is runaway! Also, he is an extremely difficult patient. I would appreciate any suggestions. How much does a kidney dialysis procedure cost? Who pays for this? what about peolple with HIV? how uch will it cost and doed traditional medicaid will cover it? Thank you for this article, it's very informative. Can you please tell me about how many deaths are related to dialysis access ports located in the chest? very good,well presented and very much informative article. thank you so much. well appreciated. Dialysis technician i think is a very difficult job, that's why i have to gather information from any site for me to have background to make it easy. Thanks to you for such an informative blog. I am interested to whether this hemodialysis system is selective separation system for contaminents depending upon their molecular size or it can be performed depending upon their selective extraction process. for detailed discussion please contact me on my email id. when having kidney dialysis is a port or cathater put in the neck? Hope your service is efficient and customer friendly. My son has been told by his vascular surgeon that he has to have his blood tests in his hand not his arm. But the nurse his taking it out of his right arm. Also i have been told that his blood pressure should be done on his right arm. Could you please tell me what is the right thing to do. How many hours is a patient dialysized? Dose it depend on how much fluid, or the per centage function of the kidney. My brother is on the machine for 4 hours. im going to a dialysis procedure sooner,i read all this good questions but i dont see or hear the answer. is there any way i can get all this interesting question? When going to a new dialysis center do they test your blood for HIV or do they just use your blood work from your old center?